Date: Feb 20 2019, 6 p.m. - 10 p.m.
Do you have the perfect Poker Face? 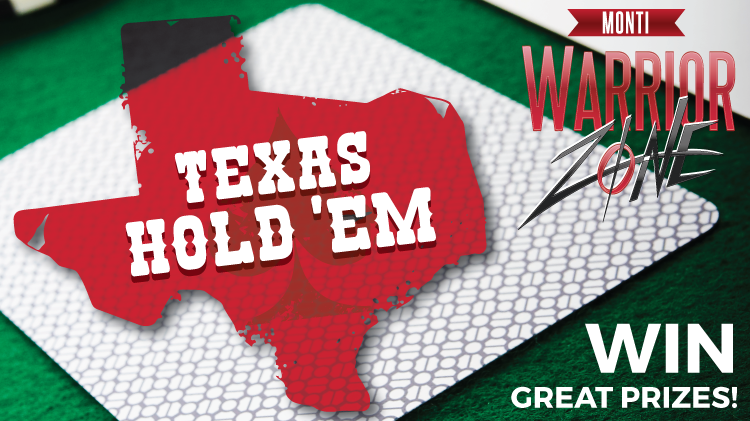 If so, why not try it out at the Monti Warrior Zone's Texas Hold'Em event? Join in and challenge the best players! Prizes will be awarded for 1st, 2nd, and 3rd place each night. For more information, call the Warrior Zone at 915-741-3000. The cost is $15 per person and it includes one drink. Registration is required and can be done at the Monti Warrior Zone front desk.